Cycling in the centre of Amsterdam is not something I get to do very often, but earlier this month I jumped at the opportunity. I cycled to and from a round table meeting about the future of ‘fast cycle routes’ in the Netherlands. The meeting was organised by FietsFileVrij (which can mean both “cycle away from traffic jams” and “cycle traffic jams away”). 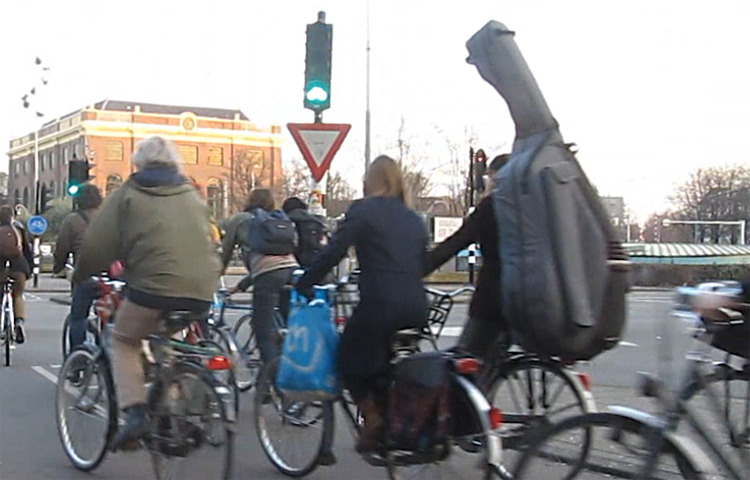 People cycling at Meester Visserplein in Amsterdam. It was an interesting meeting with some very interesting presentations too. Lucas Harms of the University of Amsterdam presented some of the latest trends and developments, that came to light in an ongoing investigation into social and spatial differences in bicycle use. This study, that the University will publish about later, is not only looking into how people travel, but even more why people choose to travel like that. Other studies revealed earlier that young people in Germany and also in the US have less interest in cars than the generations before them. The Amsterdam investigation shows this trend is now also becoming visible in the Netherlands. Unlike their peers in the US and Germany, the younger adults do still have a driver’s license in the Netherlands, but they use cars far less than the over 30s. In fact, 15% of all people cycling in the Netherlands is between the ages of 18 and 30 and their share has gone up 4% since 2000. At the same time their use of cars went down by 5%. A clear shift, indicating that cars have a lot less status for the younger generation. When young adults use cars, they do so in shared cars more than in cars they own. Sharing a car with other people has become much easier with the help of social media and ICT. And young people are not the only ones who cycle more. The over 65 year olds are also cycling more often and further. This is different for other age groups and for people with a non-Dutch ethnic background. 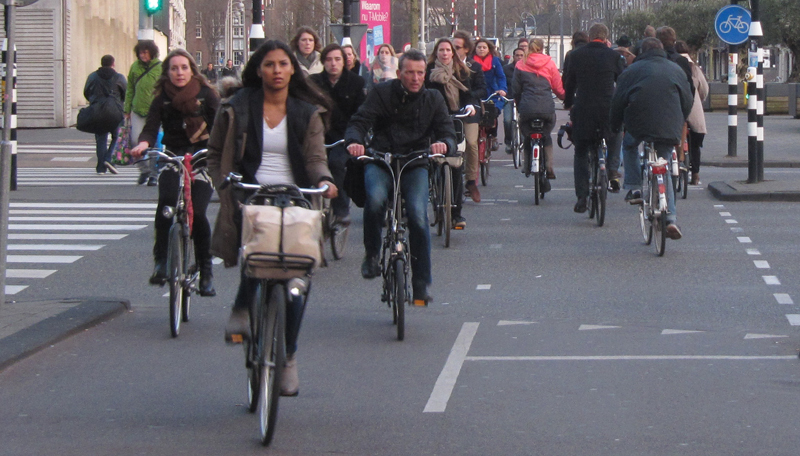 A preliminary conclusion of the study is that cycling in the Netherlands is increasing, but not everywhere, not for all groups in society and not for all activities. Changes in the way of life play a large role in these developments. When published, all these recent facts and trends will be perfect to base modern cycling policies on. The city of Amsterdam also published some updated facts about cycling on their website recently. 1 in 5 of the people of Amsterdam is annoyed by bicycle wrecks on the street. On the way back to the Central Railway Station I stopped at Meester Visserplein in the city centre and set up my camera. It was around 5:30pm and rush hour was still going on. The junction is very busy, a main cycle route crosses a main motor vehicle route, but traffic flows smoothly and relaxed. The old building in the distance is the 1675 Portuguese Synagogue. Not everybody follows all the rules to the book, but most of those people endanger themselves first and foremost, not really other people. Note that the lights for cyclists are on the near side. A second light is visible but that is not a repeater light. It is the light for the second carriage way. The cycles of both lights are coordinated but not the same. This is also true for the pedestrian traffic lights. They are not green at the same time. The light cycles are also of a different duration, depending on the amount of traffic. The video shows an interesting parade of all sorts of people cycling. One man cycles with a huge case on his back. Judging from the shape it must hold a double bass! Man cycling with a double bass on his back. Sure, why not? There is a new post every week and the alerts are getting out ( I get one myself too) so maybe you have an over active spam filter or something else goes wrong. You could try to enlist anew. And then I hope you will get the alerts once more. Looking at the video, I can understand all the concerns with motor scooters in the bike paths. If I lived in Amsterdam I would want them banned also. Great, your blog gives me a lot of information … thx a lot! Really, you have become one of, if not my favourite blog of all time. Well written, concise and the type of information that the world needs. People are literally dying for this information, and here it is. The videos are excellent teaching tools too, I’m so impressed. Thank you. Another excellent post, Mark. 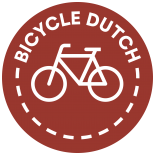 I’ve pingbacked to Bicycle Dutch and I’ll circulate those statistics DownUnder. Every little helps, but we have a long way to go! This entry was posted on 28 March 2013 by Bicycle Dutch in Original posts and tagged Amsterdam, rush hour, watching people cycling.